Photo of Stacey Graham taken by Sephera Giron. 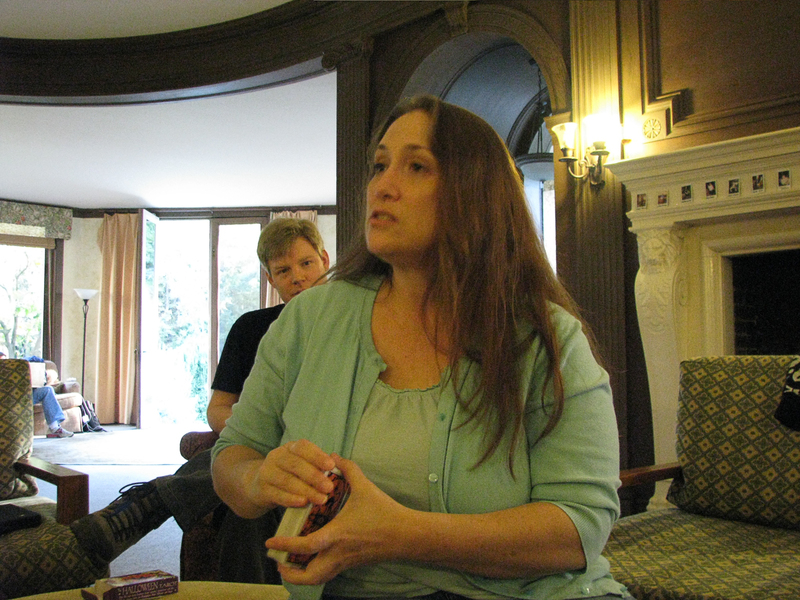 Stacey Graham joined the Haunted Mansion Writer’s Retreat for the first time in 2012. She is the brains behind the Zombie Tarot, author of quirky books such as the Girls’ Ghost Hunting Guide, and the upcoming Haunted Stuff: Demonic Dolls, Screaming Skulls, and Other Creepy Collectibles (Llewellyn 2014). She’s also the mouthpiece for Undead Fred at the Zombie Dating Guide website. Please visit her website at staceyigraham.com, her Late Bloomer blog at staceyigraham.blogspot.com, or catch up with her on Facebook at facebook.com/authorstaceygraham or on Twitter at twitter.com/staceyigraham. She lives outside of Washington, D.C. with her husband and five children. 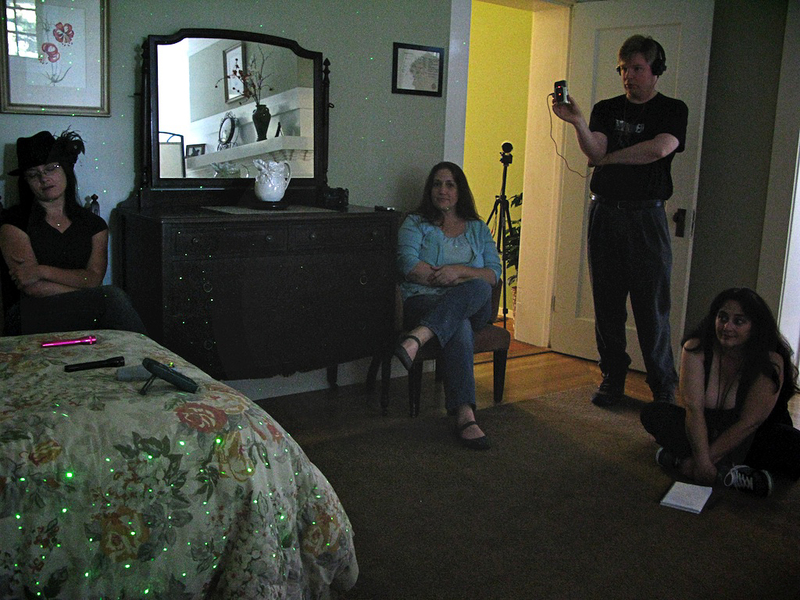 Stacey in the blue joins Diane of the GhostGirls, Christian Colvin, and Sephera Giron ghost-hunting at the Mansion. Photo by Nichole Boscia. SG: I’ve been chasing ghosts for over 20 years, both as an investigator/researcher and as a writer of ghost stories. While in the field, I’ve had my hair pulled, my nose tweaked, and something breathe heavily in my ear. I’ve seen many odd things on investigations, but I’m still waiting for a floating head. SG: The morning after I arrived, I descended the stairs to meet everyone for breakfast. I passed a mustachioed man on the steps and moved out of the way for him to pass me by the banister. Later, I realized we had no such guest staying at the Mansion. On the morning we left the house, I was awakened around 5:30 a.m. by the sound of furniture moving directly below my room, in the dining room. It was quite loud and involved heavy tables, glassware, and chairs being thrown around the room. This lasted for over an hour. When I went downstairs with a friend, we discovered nothing had been moved in the dining area. 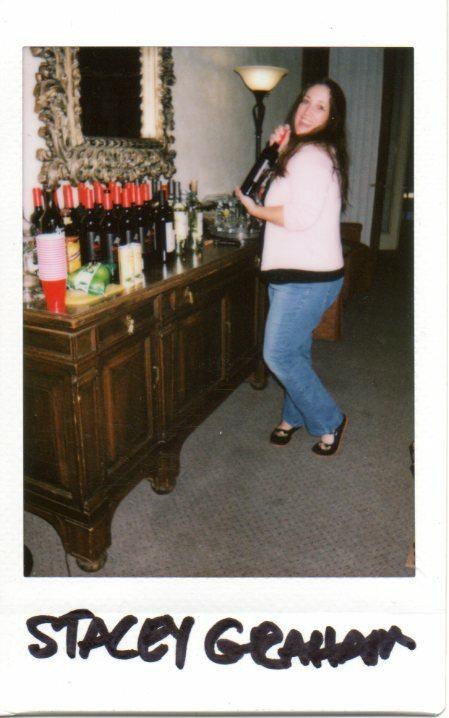 At the last retreat, Rain Graves took polaroids of all the attendees in case they vanished in the course of the weekend. Q: What inspired “Dance with the Devil,” the story you wrote for The Haunted Mansion Project: Year Two? SG: I’ve always wanted to write about séances. I thought I’d spice it up with a little ’50s pimento dip and see what the ladies could get up to. I write horror lite and always throw in a good dose of humor in my stories. SG: Llewellyn Publishing will release my next book in August 2014. It’s called Haunted Stuff: Demonic Dolls, Screaming Skulls, and Other Creepy Collectibles, about haunted objects. Some of my, and writer S.G. Browne‘s, experiences at the Mansion are featured in the chapter on haunted hotels. This entry was posted in author interview, Blog tour and tagged ghost stories, Haunted Mansion Project, horror writers, Stacey Graham. Bookmark the permalink.